On Tuning Fork orders placed this month-you will receive a FREE TFT stress hockey puck as my gift to you. Sorry, offer is only good until supplies are depleted but I do have more than 50 of them to give out. Tuning Fork Therapy® currently offers eight levels of training and certifications, along with some additional add-on courses such as TFT Color Therapy, Animal Practitioner, and Chakra Energy Worker courses, among others. Courses can be completed on site or through long distant learning. Each level comes with tuning forks, a pinrted manual, hand outs and/or DVDs (if any are included in the particular course that you selected) and instruction sheet. Our tuning forks are made either here in the U.S. or in India using only the best aluminum alloy. Offering up to 12 ce's for Tuning Fork Therapy massage and 8 ce's for each level of certification. Homestudy available for each level of training. Combine the beautiful healing power of Usui Reiki with tuning forks. Earn two certifications at the same time. The Tuning Fork Therapy® Logo is ONLY for those students who have completed the coursework and registered with this website-ONLY. Please report all abuses of this trademark to me. Thank you. Build up your finger muscles! Discover how to use copper wands in the vibrational healing session. Opens and balances chakras, moves stagnant energy, and more. "Tuning Fork Therapy®" is copyrighted. "Tuning Fork Therapy® Practitioner" is also copyrighted. Discover what your eyes have to say about your past, present, and future health. I am currently working on several research projects and will have my work published as soon as they are completed. If you are in the area and would love to become one of my patients in a reserach project, just drop me an email to FrancineMilford@cs.com and I will let you know what is currently available. All participation in a research project is free. There is never a cost for you to become a part of my research projects. There are two projects happening this year and you can participate in one or both of them at this time. One will be finishing up before fall and the other will run through the end of this year. 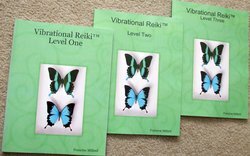 Discover how Sound and Vibrational Healing Therapies using tuning forks can bring balance, stress relief and even pain reduction through simple methods and techniques. Simple and safe to use on children and pets. Discover how to incorporate tuning forks into your daily healing sessions with Reiki, Polarity, massage, acupuncture, acupressure, Bodytalk and so much more. Is Tuning Fork Therapy® something your school or healing center would like to offer? I can travel to your location for as little as 6 paid students. ($399 per student). After 6 students are paid up for classes, the person hosting the class will receive their certification for free. All materials will be included in the student kits for workshop attendees. There is nothing more that the students will need to pay for. Please note that the cost of the student kits is separate from the total cost and will not be subject to splitting. Current cost of the level one student kit for 2019 is $69.99 and includes the printed manual, hockey puck, and 8pc student Harmonic set, along with registered certificates for students completing the workshop. NCBTMB and Florid Ce's and BOC ce's are available for those professionals who need to recertify their massage or NATA athletic trainers. 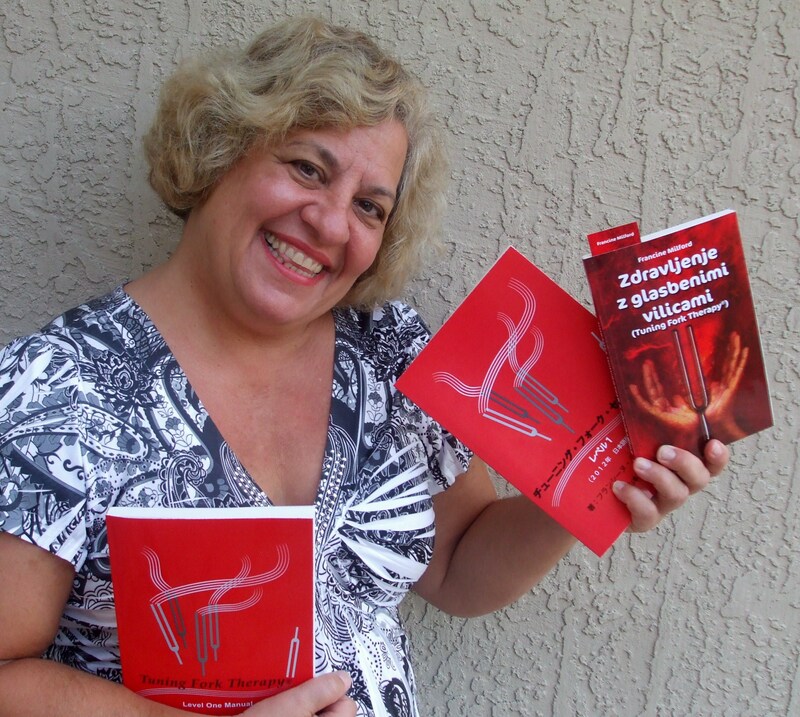 I am thrilled to be able to offer the level one book in a variety of languages. First up is the Slovanian language. Second is the Japanese level and two, and Third is Chinese. Tuning Fork Therapy® has been registered in the United States Patent and Trademark Office. 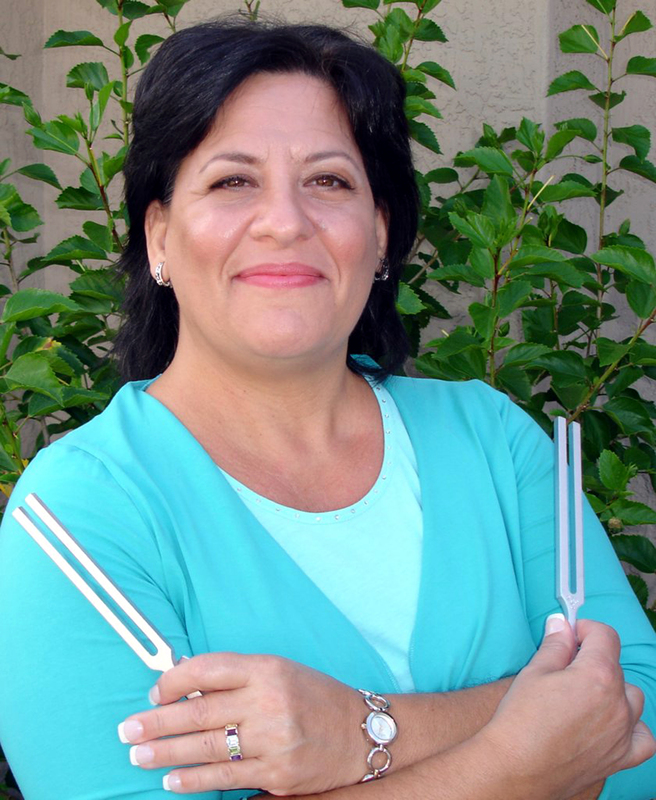 Only those students who have successfully completed a Tuning Fork Therapy® Practitioner certification from a registered instructor may use the words 'Tuning Fork Therapy® Practitioner' in their advertisements and on their business cards. If you have any questions, please contact me at TFtherapy@cs.com. Remember-ONLY those students who have become certified and registered through this site can offer 'Tuning Fork Therapy® Practitoner courses.' This is a trademarked name. NEW!!! I am looking for people who can translate this book into another language. Great business opportunity to the right person. Please send resume and clips of your work to FrancineMilford@cs.com. This is a business opportunity-not a paid assignment. If you are interested in translating this book as a business opportunity, please contact me at FrancineMilford@cs.com. Cost is only $97 a year!!! PLEASE NOTE THAT THE PO BOX IS NOW CLOSED-All correspondence should now me mailed to my home address listed at the bottom of the page. Please Note--I will NOT ship products outside of the United States with totals less than $200. If you want to place a large order, contact me first at TFtherapy@cs.com. If you insist on ordering anyway, your money will be refunded to you LESS the fees paypal charges me for making the refund. Want to Join our Email List to receive exciting offers and latest newsletter-Sign Up for FREE. Just drop me an email at FrancineMilford@cs.com.